Santini divides the equestrian world into civilians (amateurs) and officers of the “mounted arms” (professionals). Piero Santini. Riding Reflections. New York: Derrydale Press, 1932. Revised edition, London: Country Life, 1950. Out-of-print. Piero Santini (1881-1960), disciple of Federico Caprilli and a major in the Italian cavalry, produced a trilogy of books in English, circa the 1930s, advancing Caprilli’s revolutionary system of equitazione naturale: Riding Reflections (1932), The Forward Impulse (1936), and Learning to Ride (1941) (the last was reissued in 1952 as The Riding Instructor). Xenophon Press has reprinted The Forward Impulse and Learning to Ride; Riding Reflections, unfortunately, remains long out of print and available only on the secondary book market. The birth of the forward seat: Captain Caprilli in 1904. 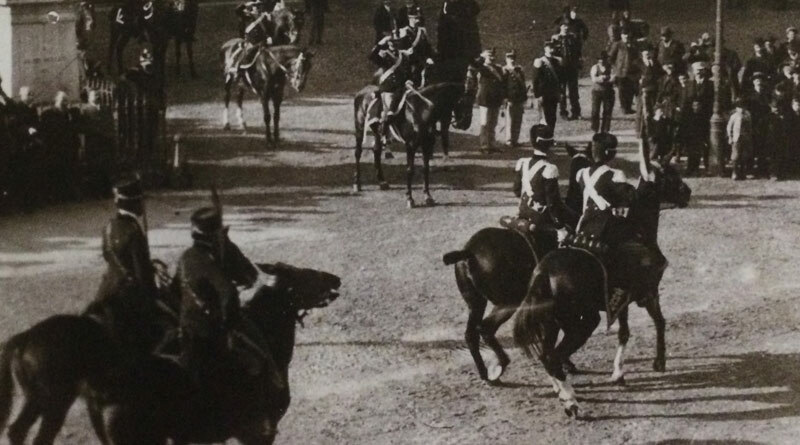 In 1932, “well-organized cavalry schools” still trained officers who were becoming military anachronisms but were dominating international equestrian competition. Riding Reflections addresses civilians (or amateurs) in the third and perhaps second categories: it aims to correct “current defects and misconceptions regarding riding position in those past the tyro stage and therefore not in need of primary instruction.” In 1932, Santini could posit his underlying distinction between military riders as professionals and civilian riders as amateurs, because “well-organized cavalry schools” still trained officers who were becoming military anachronisms but were dominating international equestrian competition. That distinction would fade by 1936, in The Forward Impulse, and all but disappear by 1942,in Learning to Ride. Santini’s animus toward the show ring introduces a second signal theme of his trilogy: the forward seat is fundamentally a cross-country seat — and only, as an “afterthought,” a show jumping seat. In Riding Reflections, this theme takes the form of an extended paean to hunting with hounds. Cross-country riding, briefly put, is “the only bona fide sport … in which man and horse associate”; hunting is the oldest expression and the epitome of cross-country riding; and the forward seat is “supremely adapted” to hunting. The emphasis on hunting over mounted warfare may seem paradoxical, given Santini’s opening distinction between military professionals and civilian amateurs, but it has a historical logic. Santini’s encomium to the hunt, together with his comment that “war and the chase have gone hand in hand through the centuries,” reflect a literary tradition, dating to Xenophon, that treats the chase as training for mounted warfare. Modern Anglophone contributors to the tradition include Lewis Edward Nolan, whose Cavalry: History and Tactics (1853) argues that military horses and riders likely benefit more from hunting than from dressage; E. A. H. Alderson, whose Pink and Scarlet, or Hunting as a School for Soldiering (1900) offers a treatise on its titular subject; and Siegfried Sassoon, whose Memoirs of a Fox-Hunting Man (1928) foreshadows and pairs with his Memoirs of an Infantry Officer (1930). In addition to reflecting that tradition, Santini’s trilogy also reflects the flux and uncertainty of the entre deuxguerres moments that Sassoon and Santini shared. Clearly meant to extend beyond the boundaries of equitation per se, Santini’s writings shadow an evolution in European culture and politics of the period from nostalgia to aggression to guarded hope. The Forward Impulse deploys the strident bombast of a manifesto from start to finish; Learning to Ride merges the pedagogy of a guidebook with the passion of an equestrian gospel for the next generation; and the first foray, Riding Reflections, transcends the condescension of its preface and approaches the reflectiveness of an elegy.